This report presents the results of 78 interviews and 275 surveys completed with prosecutors in Jacksonville, FL, Chicago, IL, Tampa, FL, and Milwaukee, WI. It is the first in a series of reports of the national project focusing on advancing prosecutorial effectiveness and fairness funded by the MacArthur Foundation. The project is lead by researchers from Florida International University's Department of Criminology and Criminal Justice and Loyola University Chicago's Department of Criminal Justice and Criminology. The report presents findings pertaining to five topics: perceptions of prosecutorial success, current priorities and office mission, community engagement, use of incarceration, and racial and ethnic disparities within the criminal justice system. For each of the four partner offices, we describe what prosecutors told us regarding each of the five topics and what we learned from the interviews in each jurisdiction. This is supplemented with information on how prosecutors responded to several different survey questions relevant to each topic discussed in the interviews. 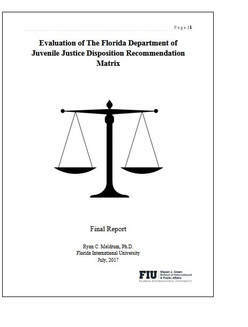 As part of the Juvenile Justice System Improvement Project (JJSIP), the Florida Department of Juvenile Justice began implementation of a Disposition Matrix starting in 2013 to guide Juvenile Probation Officers in their recommendations to the court. This report represents the second evaluation as to whether youth who received dispositions within the Disposition Matrix guidelines were less likely to recidivate than youth who received dispositions which deviated from the Disposition Matrix guidelines. 1. Of the dispositions examined, 97% fell within the guidelines of the Disposition Matrix. Youth who scored higher on the Positive Achievement Change Tool (PACT) were less likely to receive a disposition within the guidelines of the Matrix. Male youth were less likely than female youth to receive a disposition within the guidelines of the Matrix. Black youth were more likely than White youth to receive a disposition above the guidelines of the Matrix. Youth in the North region of the state were more likely to receive a disposition above the guidelines of the Matrix. 2. A conservative estimate is that, across all youth in the state, receiving a disposition that is above the guidelines of the Disposition Matrix increases the likelihood of recidivism by at least 75%. The data indicate this might be significantly higher for some subgroups of youth, particularly Black youth.